An intriguing instance of pictorial borrowing in a Blake design is his appropriation and modification of the central figures from an engraving (illus. 1) by Giulio Bonasone (1531-74), derived from a fresco by Polidoro (Caldara) da Caravaggio (1495?-1543). From Bonasone Blake drew inspiration for elements of his frontispiece picture depicting Leonora’s dream in the third “New” edition in 1796 of the Stanley translation and revision of Bürger’s Leonora. The Blake picture is known only through the published stipple engraving by “Perry,” here shown in a unique proof from the collection of Robert N. Essick (illus. 2). The Bonasone engraving (Bartsch No. 83) mirrors Polidoro’s fresco with some elaboration (see Massari 1: 67-68; Marabottini 1: 78, 355-56). Polidoro and Bonasone’s subject is “Cloelia Crossing the Tiber” and depicts the Roman heroine leading an escape of hostages from the camp of Porsenna. The primary verbal source was probably Plutarch’s Moralia (Mulierum Virtutes) or a commentary upon it, for I believe that text to be the only one of the many possible sources that specifies that the escaping women wrapped their clothing on their heads; most others say little more than that Cloelia bravely swam the Tiber, with or without a horse, or received a horse later. 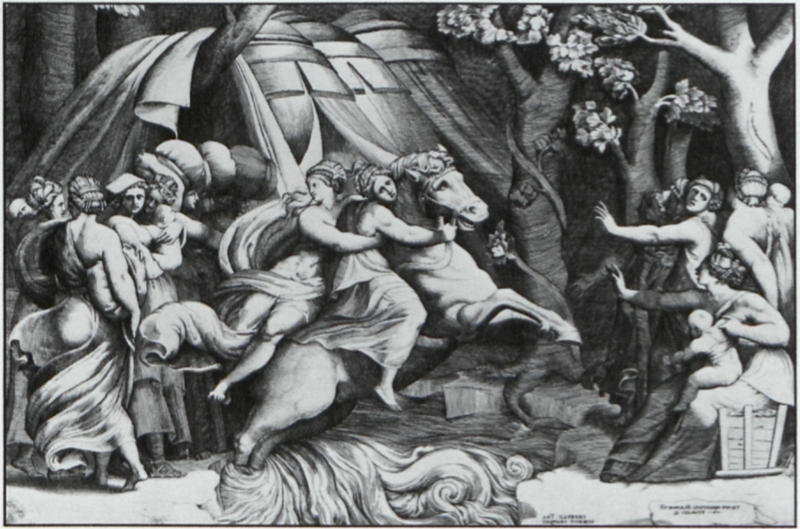 The women on the left in the engraving are presumably Cloelia’s fellow hostages, those on the right may represent by prolepsis the Romans who sent the escapees back to Porsenna, and the unhappy-looking woman clinging to the horse’s neck is probably Cloelia; the woman seeming to float along behind her may be the aristocratic Valeria. Cumberland’s initials at the end of the entry signify that he owned a copy of the print. In illustrating Bürger as translated by Stanley, Blake borrowed only the essential composition rather than the exact forms of Bonasone’s horse and its riders. Blake’s lost design was probably reversed when Perry copied it; its figures would have been oriented as in Bonasone. The stocky animal in the Italian print became an impossibly attenuated fire-breathing horse of the imagination in Blake’s hands, and he extensively adapted the riders to the context of Bürger’s poem. Cloelia was replaced by the young masculine form of Death (in the guise of Leonora’s lover William), who hails the approaching specters rather than clinging to the horse’s neck, while the blithe young woman conducted by Cloelia became the frightened Leonora, her flowing drapery replaced by a modern nightgown. No other elements of Blake’s complex design seem closely related to the Bonasone engraving, though certain stylistic features may have influenced Blake’s works as late as the engraved Dante illustrations.1↤ 1 Certain other details of Blake’s picture may have been suggested by Chodowiecki’s frontispiece for the German edition, which had been included in some copies of the first (8 Feb. 1796) edition of Stanley’s translation. 1. Giulio Bonasone after Polidoro da Caravaggio, Cloelia Crossing the Tiber. Engraving, second state. Courtesy of the Museum of Art, Rhode Island School of Design, Georgianna Sayles Aldrich Fund. And then, he dropt his Mask. Here are the original lines, cited by Night and line from Cornford’s edition (these also correspond to the text and lineation in Blake’s Night Thoughts illustrations in Grant, et al. ): “Souls . . . wander wild, through Things impossible!” (6.470-71); “He most affects the Forms least like himself” (5.827); “I’ve seen, or dreamt I saw, the Tyrant dress, / Lay by his Horrors, and put on his Smiles” (5.841-42); “(Come when he will) an unexpected Guest? / Nay, tho’ invited by the loudest Calls / Of blind Imprudence, unexpected still?” (5.386-88); “. . . He drops his Mask” (5.877). Emerson’s suggestion (19) that Blake was the adapter is more than plausible, given Blake’s involvement in illustrating the Night Thoughts in 1795-96; who else would have been so steeped in Young as to be able to recall these far-flung lines, and would have had the nerve to create such a ransom note in verse? 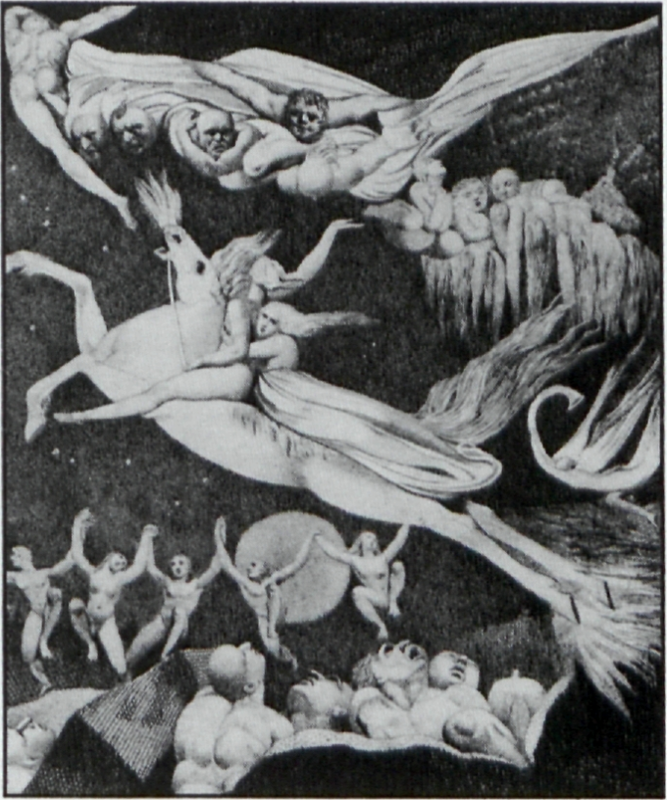 It may not be a coincidence that a very similar leaping horse also figures in Blake’s imaginative response to the description of Hal in Henry IV, Part One, the pictures of A Spirit Vaulting from a Cloud to Turn and Wind a Fiery Pegasus (also an altered quotation; see Butlin #547.6 and 658). There too a martial subject from someone else’s work is re-envisioned as an allegory about the leap of the imagination. Bürger, Gottfried Augustus. Leonora: A Tale. Trans. J. T. Stanley. “A New Ed.” London: William Miller, 1796. Butlin, Martin. The Paintings and Drawings of William Blake. 2 vols. New Haven: Yale UP, 1981. Cumberland, George. Some Anecdotes of the Life of Julio Bonasone, A Bolognese Artist. London: G. G. J. and J. Robinson, 1793. Easson, Roger, and Robert N. Essick. William Blake: Book Illustrator. 2 vols. Normal IL and Memphis TN: American Blake Foundation, 1972-79. Emerson, Oliver Farrar. The Earliest English Translations of Bürger’s Lenore: A Study in English and German Romanticism. Cleveland: Western Reserve UP, 1915. Erdman, David V., ed. The Complete Poetry and Prose of William Blake. Berkeley: U of California P, 1982. Grant, John E., Edward J. Rose, and Michael J. Tolley, with David V. Erdman, eds. William Blake’s Designs for Edward Young’s Night Thoughts. 2 vols. Oxford: Oxford UP, 1980. Marabottini, Alessandro. Polidoro da Caravaggio. 2 vols. Rome: Edizioni dell’Elefante, 1969. Massari, Stefania. Giulio Bonasone. 2 vols. Rome: Edizioni Quasar, 1983. Young, Edward. Night Thoughts. Ed. Stephen Cornford. Cambridge: Cambridge UP 1989. 2. Perry after William Blake, frontispiece to Leonora. Proof engraving with pencil. Courtesy of Robert N. Essick.